HASK Dry Shampoo collection contains various dry shampoos that are wonderful as removing excess oil, dirt and odor from your hair. I received the Argan one to try out. Removing excess oil is now easier than lather, rinse and repeat, because you don't have to do it while washing your hair! All you have to do is spray dry hair and wait, then brush through and voila! Hair looks and feels clean. Skip a wash or extend the life of your style with HASK Dry Shampoo. It contains Argan oil to leave your hair conditioned and even fresher than the first day after you wash it. Ultra-fine rice starch acts quickly to soak up oil, sweat and odor, leaving hair feeling revived, bouncy and clean. Saving time and never been this glamorous! To use: Shake well before and in-between uses. Section off hair, hold can 6-10 inches away from roots and spray onto roots. Wait 30 seconds then brush through or massage with fingertips. Style as directed. I have also tried the Charcoal version and that is more for oilier hair. I like the Argan version better because my hair is not that oily. 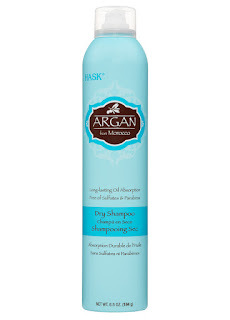 In fact is is very dry and the Argan is great because it adds oil to the hair. I love dry shampoos and use them often. HASK is one is my favorites. It works really well. It mops up any oily residue that is in your hair but definitely leaves hair feeling soft, shiny and like you just washed it.